Are you thirsty? 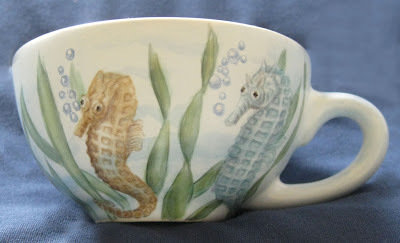 Well, I like sea horses and I've never painted sea horses so I thought I would do this cup and saucer. It was fun to paint. They are speaking in bubble. Can you translate from bubble to English? Well, what they are saying is that they are sorry that the saucer broke in the kiln. It sometimes happens. Everything goes into the kiln just fine but when you open it, what a disappointment to have something cracked or broken. So this will just not have a saucer.